My name is Steve Hickman and I am doing a bit of digging into the family past. I was born in Stonnall in the 50’s. I was actually born at Prospect House which is the old house at the bottom of Castle Hill. My Gran used to live in one of the two cottages that used to be on the small triangle on the opposite side of the Chester road. They were the Platt Family. My Grandad used to have a coal merchants yard in Brownhills High Street. ‘Thomas Platt Bros’. I belive it was by ‘Roberts Painters and Decorators’ just up from the Warreners Arms. 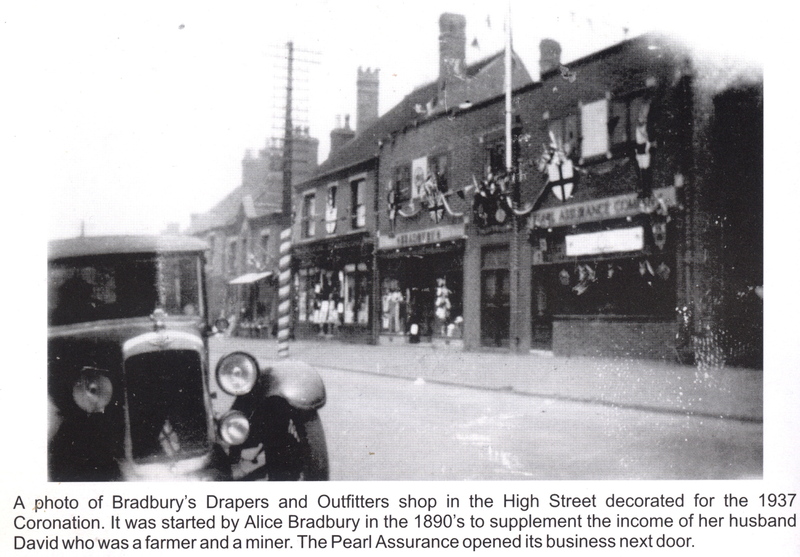 What I am trying to find, if any exist are any old photographs of Brownhills High Street around the 30’s and 40’s. What I am also trying to find out is when the track of the Chester road was changed. Where it goes past the bottom of Castle Hill, the 1902 Map shows it bending into Stonnall then back to its modern route. Any idea when it was straightened out and the little triangle was created? 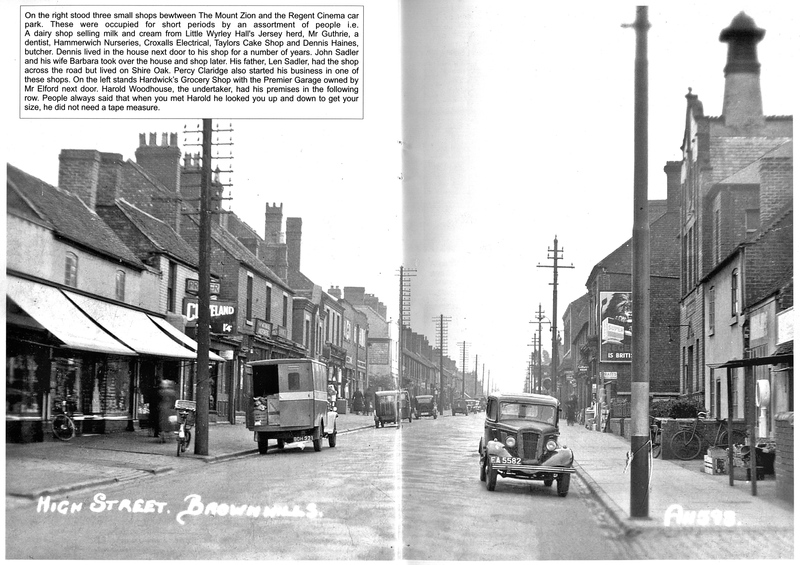 I’ll be posting about the Stonnall in the next day or so, and hope these pictures of Brownhills in the 1930’s are of interest. If you have anything to contribute, please do comment. As usual, I pay tribute to the authors of the fine photo collections I’ve taken these images from. 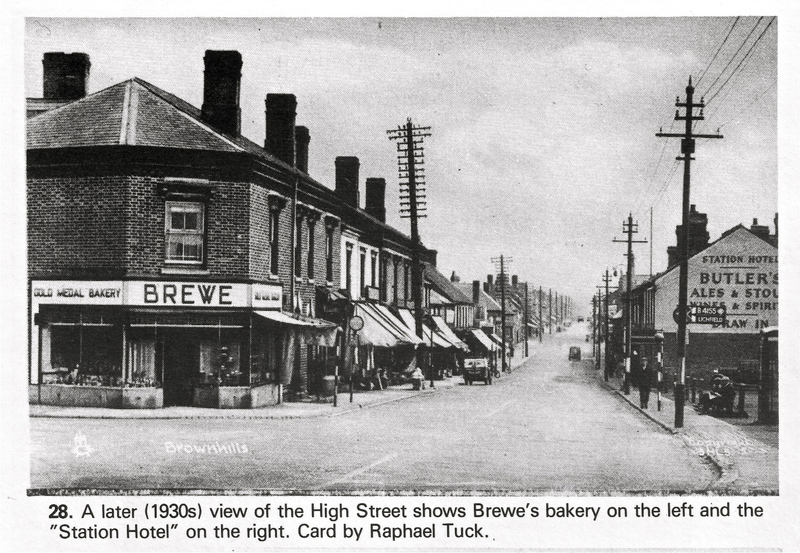 Postcard shot from the junction of Lichfield Road and High Street. On the right would now be Aldi, on the left, Starlight Photography, formerly EE Jones. From ‘Brownhills and Walsall Wood on old picture postcards’ by Jan Farrow. This remarkable image of the High Street is wonderfully detailed. The bikes, motion in the pedestrians and those lovely old cars… I’m not entirely sure, but I think this photo would have been taken from about where Downes newsagent stands today, looking up town toward Shire Oak. So much changed, so much lost. Taken from ‘Memories of Brownhills Past’ by Clarice Mayo & Geoff Harrington. I know Bradbury’s was in the middle of the High Street, and think it was possibly about where Latif’s is today, but I can’t be sure. Taken from ‘Memories of Brownhills Past’ by Clarice Mayo & Geoff Harrington. Looking the other way now, toward Mount Zion and the Town Hall. 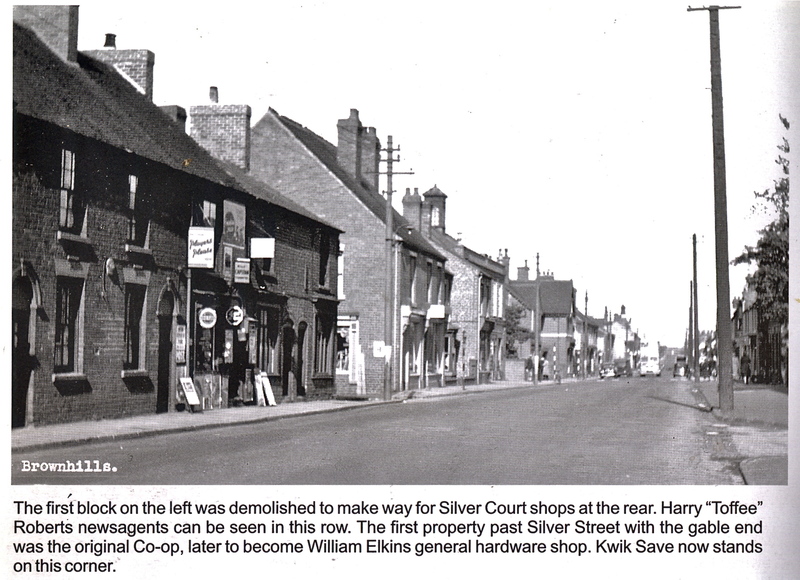 I just about remember going into Elkins Hardware with my old man in the seventies, before it was knocked down. I remember the smell, a mix of peat and paraffin. Taken from ‘Memories of Brownhills Past’ by Clarice Mayo & Geoff Harrington. This entry was posted in Brownhills stuff, Environment, Followups, Interesting photos, Local History, Local media, Reader enquiries, Shared media, Shared memories and tagged Bradburys, Brewes Bakery, Brownhills, Brownhills and Walsall Wood in Old Picture Postcards, Brownhills local history, Claridges, Elkins, Harry Roberts, High Street, Local History, Memories of Brownhills Past, Mount Zion, New Photos, Station Hotel. Bookmark the permalink. The price is remarkable, too – is that normal for a postcard of that vintage? That might be great uncle ColinCatshill on a recce mission for his freesheet ‘Brownhills Bugle: life is the southern wastes of Staffordshire’ which had a very limited circulation. Usually BrownhillsBob is spot on, unfortunately this time he is a little wide of the mark! The cyclist is actually my great grandfather, and would-be journo, StonnallStan – I believe that the photo of him approching the bakery captures the visionary and pioneering moment that he conceived the idea of the ‘newspaper free giveaway’ promotion. Sad to say he was a man before his time and his ‘free jam buttie inside every copy of soar-away The Stonnall Star’ – came to a sticky end! In answer to Steve’s query about Chester Road, apparently the so-called ‘Stonnall Kink’ was straightened out in 1920. It was necessary to demolish the two cottages to which Steve refers to make way for the new section of road. These two cottages suffered the fate of many other dwellings in Old Stonnall. A traveller in the early 19th century noted as many as 40 houses in the village, but that most were in a serious state of disrepair. The passing traffic between London and Chester had once supported a bustling village community and two hostelries, the Welsh Harp and the Swan. However, in the early 19th century a route to Chester via Birmingham and Wolverhampton became favoured, which led to Stonnall’s economic decline and hence a decline in the quality of its housing stock, not to mention the closure of the Welsh Harp and the demolition of the Swan. In the near future, I will be publishing a new paper which, amongst many other things, attempts to explain how the kink developed in the first place. The building that was once the Welsh Harp still exists at Old Chester Road – now referred to as Main Street – whereas the Irish Harp is located where it has always been, near Little Aston. There was no name change. The two public houses were always separate entities. There is indeed a pub in Stonnall called the Swan, but it is not the original Swan which, now demolished, was also located on Old Chester Road near to the village pond (which influenced the choice of name) opposite the Manor House. The original Swan was set up as competition to the Welsh Harp. It was also a farm. The choice of names for the Welsh Harp and Irish Harp is an interesting topic, but the latter has little direct connection with Irish railway workers. In fact, the two pubs received their names for the same commercial reason: Chester Road was once a major route for travellers between London and North Wales. This means that many of the people en route were either Welsh people, or Irish people making their way to and from Holyhead, where there always has been a major connection to Ireland. The two pubs were so-named to reflect the nationalities of many of the travellers so as to provide a ‘home-from-home’ ambience for the simple reason of attracting more visitors. My new paper will go into the detail of this and many other related topics. I welcome contributions from all readers to this fascinating debate, but I’d just like to thank you Julian for your input. Your paper on the Lost Lake of Stonnall is on permanent favourite here and your research and diligence is a shining example to every amateur history researcher. I look forward to your next piece on Stonnall and Castle Hill. Please drop me a line when you publish it and I’ll plug it here – you work, like that of Tamworth Time Hikes is fascinating, wonderfully researched and very popular with Brownhills Blog readers. I welcome contributions from all readers of the blog, and to Jeepboy in particular I’ll point out that I’ve a surprise in store next weekend… stay tuned.